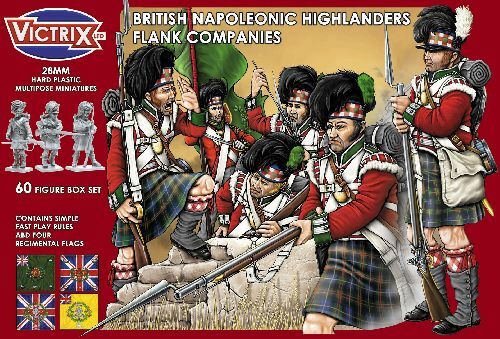 Napoleonic Highland Infantry Centre Companies. These sets contain 60 figures including officers, Standard bearers, sergeants, drummers and pipers. The mix of poses feature marching, advancing and firing/loading positions. Both Highland Infantry sets will include flag sheets for a number of Highland regiments. Figures made of Hard Plastic, supplied unpainted and require assembly with glue.